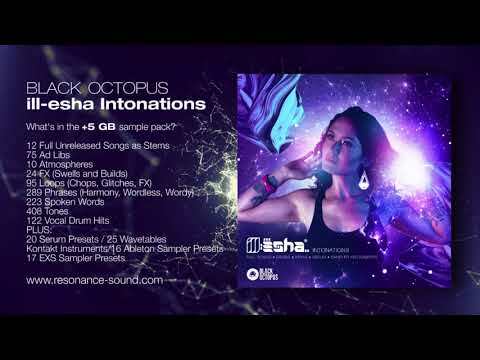 ill-esha arrives with ‘Intonations”, a truly groundbreaking & innovative vocal pack for all styles of music! This MONSTER 5GB+ pack is one of a kind that is sure to inspire you in your music productions for many years to come. Pop, Techno, Trance, Dubstep, Hip Hop, you name it. It's all possible with this pack! Tags: Dubstep, EDM, Electro House, Future Bass, Trance, Vocals, Xfer Serum Presets. – Random phrases, adlibs and slides recorded in A, B, C, D, E, F, and G minor (at 120 BPM). Some are lyrical, some are wordless, and some are done through various vocoder/harmonic effects. – Vocal tones spanning more than two octaves pronouncing four syllables (AH, MM, OO and OH) in three different “character” voices – Breathy, Soulful and Straight. – Loops at 100, 120, 140 and 160 BPM, in various keys.